Join on an Adventurous Tour of Sri Lanka. 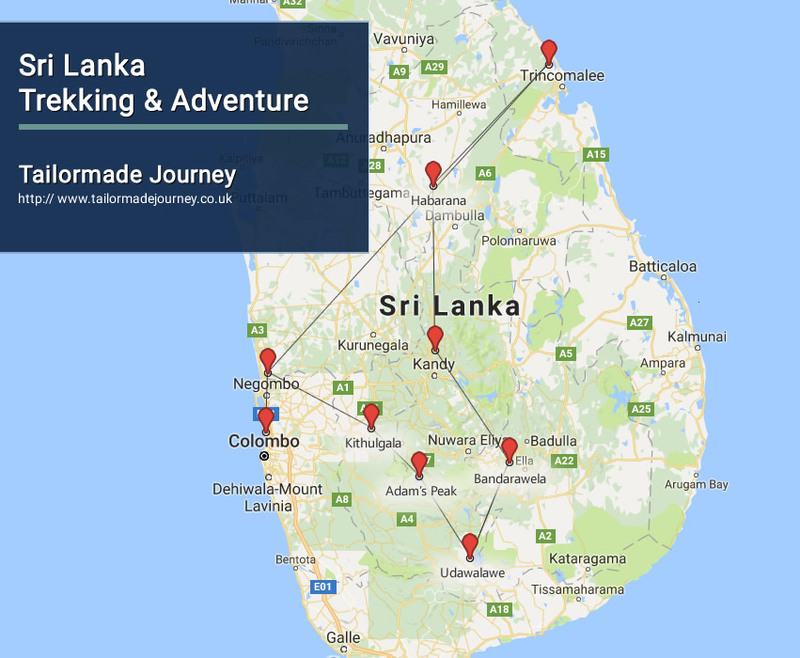 This tour takes you to the various trekking routes of Sri Lanka along with a Glimpse to the Local Village Life and Culture. Arrive Negombo 1 Night > Drive Kithulgala 1 Night > Drive Adam’s Peak 1 Night > Drive Udawalawe 1 Night > Drive Bandarawela 2 Nights > Drive Dambana 1 Night > Drive Kandy 2 Nights > Drive Habarana 1 Night > Drive Trincomalee 2 Nights > Drive Negombo 1 Night > Drive Colombo & Leave. Dinner and Overnight Stay at the Hotel in Negombo. PINNAWALA……The Pinnawala Elephant Orphanage is one of Sri Lanka’s most popular attractions. Situated halfway between Colombo and Kandy, the orphanage has a population of about 75 elephants, making it the world’s largest collection of captive elephants. The elephants here range from newborn calves to elderly matriarchs and include orphaned and abandoned elephants, as well as those injured in the wild. Amongst them are its famous residents, Sama, the lame elephant injured by a land mine during the ethnic conflict in the North and Raja, the blind elephant. Experience the sheer delight of watching these great pachyderms frolic in the river at bath time or the baby elephants being fed twice a day. Dinner and Overnight Stay at the Camp Site in Kithugala. ADAM’S PEAK or Sri Pada as it is known locally, with its pinnacle soaring into the sky, is an imposing site visible even from the sea. The origin of the name is derived from a claim made by early Muslims, it is described that this was the Garden of Eden, where Adam first set foot on earth. The mountain is 2243 meters in height. Located amidst a mix of lush green tea estates and virgin forest in the hill country, it is home to thousands of butterflies that migrate during the season. At its summit, according to folklore, the sacred footprint of Lord Buddha is housed inside a Temple. Significance of this venue is highlighted due to the journey in the mist laden trek that begins at 3:00a.m to reach the summit to witness a spectacular sunrise, a surreal experience that will be forever cherished. Because of the limited space at the peak we will arrange basic facilities. Dinner and Overnight Stay at the Hotel in Udawalawe. Dinner and Overnight Stay at the Hotel in Bandarawela. Early breakfast at the hotel and transfer to Ella by vehicle. Begin the trail approximately 1100m above sea level and descend to 250m above sea level. Continue the Trek through the paddy fields & enter the thick jungle located at the edge of the paddy field. This path is quite challenging because of the muddy soil, undergrowth and occasional steep descends. Cross the Kiridi Oya River by foot. (Water level is up to your chest level -Safety rope will be provided) You can enjoy a dip in the cool water before lunch which will be set up at the river banks. During this trail there is plenty of wild life, flora & fauna. Look out for wild boar, barking deer, mouse deer and a rare jungle cat that can be seen on this trail. Ideal for birders as birds and butterflies are in abundance in Ella. Check in at your campsite for lunch. DAMBANA is a remote jungle village of indigenous people, situated about 300km from Colombo. The population of these indigenous ‘Veddha’ people ((Indigenous people of Sri Lanka) now consists of only about 350 families, a number significantly reduced from a once thriving community. The ‘Veddha’ are so influenced by the imposing dominant culture that they risk losing their traditions and what has been their livelihood for centuries. However, they remain determined that their way of life will continue into future generations. The Chief himself told us on a recent visit to the village that his main worry is that he may not be able prevent the ‘Veddha’ traditions from dying out during his own lifetime. Visitors to this fascinating village have the opportunity to meet and chat with the people who live there, learn about their traditions, and gain a unique insight into their way of life. Dinner and Overnight Stay at the Camp Site in Dambana. THE KNUCKLES MOUNTAIN RANGE……Located in the central highlands amidst a stunning landscape of tea plantations and beautiful scenery, the range derives its name from its resemblance to the knuckles of a clenched fist. The residents of the area refer to the mountain range as the Dumbara Kanduvetiya or mist-laden mountain range as it is often concealed in thick cloud. The area is home to a high percentage of the country’s biodiversity, with its varieties of endemic fauna and flora. An unusual phenomenon of the mountain range is that all of the islands climate conditions can be experienced within a half hours walk through the valley. During this trail you will be visiting Meemure (Village) which is used to be one of most remote areas of Sri Lanka. You will learn how they used to live with minimum access to the world. PERADENIYA…….A few kilometers from the city of Kandy are the Royal Botanical Gardens – Peradeniya, claimed to be the best in Asia and one of the best of its kind in the world. Dating back to 1371, when King Wickremabahu kept court at Peradeniya, the ground work for its conversion as a botanical garden was formulated by Mr. Alexander Moon in 1821. A special attraction is a tree planted by King George V and Queen Mary of the United Kingdom in 1901 referred to as the Cannon Ball as a result of the fruit it bears. The garden is famous for its orchid house which comprises more than 300 varieties of exquisite orchids. The spice garden and the palm trees are some of its other interesting features. KANDY……….Locally referred to as Maha Nuwara, meaning The Great City, Kandy is the Hill Capital and one of the most scenic cities in the country. It is also home to one of the most revered places of the Buddhist community in Sri Lanka, and around the world. The sacred Tooth Relic of the Buddha, is housed in the temple, known as the Dalada Maligawa. In one of Asias most celebrated festivals, The Esala (Kandy) Perahera (held in July/August), where the inner caskets housing the sacred tooth relic, is taken through the streets in a grand procession of dancers, drummers, torch bearers and over a hundred beautifully costumed elephants. Steeped in history and located at the foothills of the central highlands, the city was designated a UNESCO World Heritage Site in 1988. Its not only its places of historical significance that make Kandy a popular tourist destination, but also the shops displaying precious and semi precious stones, skillfully crafted jewellary, handicrafts, colourful batiks and silks; and of course there is the expansive Peradeniya Botanical Gardens, the largest and finest in Sri Lanka – a must do. Udawatte Kelle – a primeval forest is Kandys lure for nature and adventure enthusiasts. This forest reserve contains a variety of trees and is a haven for a variety of fauna and flora, ideal for an early morning nature walk. DAMBULLA………The city is home to one of Sri Lankas seven UNESCO World Heritage Sites; the richly painted cave temple complex, is the islands largest and best preserved. Though there are more than 80 documented caves in the area, the most significant are spread over 5 caves, which comprise of statues and paintings related to Lord Buddha and his life. After an early breakfast, proceed on a cycle trail to Sigiriya (Duration 3 hours) which is on flat terrain. This trail runs alongside man-made irrigation tanks and canals, paddy fields and gives you a good glimpse of the local countryside. Dry zone birds are the main highlight of this trail. Sometimes you might spot a wild elephant over the electric fence. Dinner and Overnight Stay at the Hotel in Trincomalee . Dinner and Overnight Stay at the Hotel in Negombo . Situated in Maskeliya in the Nuwara Eliya District Region, 33 km from Nuwara Eliya, White Elephant Hotel boasts a barbecue and views of the mountain. Guests can enjoy the on-site restaurant. Free private parking is available on site. Certain units have a seating area for your convenience. A terrace or balcony are featured in certain rooms. Each room is equipped with a private bathroom. White Elephant Hotel features free WiFi throughout the property. Situated in dense rainforest of Kitulgala, Palmstone Retreat offers the benefits of an outdoor swimming pool, a waterfall and a spectacular view of nature. Free WiFi access is available throughout the property. The spacious and bright air-conditioned rooms have flat-screen cable TV and seating area with sofa. The attached bathrooms come with free toiletries, a hairdryer and shower. Rooms also have the option of a private plunge pool and sauna or a spa bath and private deck. Guests can enjoy water rafting and bird watching at the property. The area is popular for canoeing. The restaurant offers both international and local cuisine. Guests can enjoy a romantic dining experience on the private deck overlooking the waterfall. The Gateway Hotel Airport Garden features an outdoor pool and tennis courts. It also offers 2 dining options and a shopping arcade. The Gateway Hotel Airport Garden is less than 5 km from Bandaranaike International Airport and Katunayake Town. Airport shuttles are available at an extra charge. The air-conditioned rooms are equipped with satellite TV and minibar. Each room comes with a private bathroom. Guests can browse books, jewellery and souvenirs in the hotel’s shops. The hotel also has a fitness centre and a business centre. Other services include car rental and currency exchange. International dishes are served at the 24-hour Buzz Coffee Shop. Other dining options include Lobby Lounge and in-room breakfast upon request. Chaaya Blu Trincomalee is 2 minutes walk from the beach. Chaaya Blu Trincomalee is a luxurious 4-star beachfront resort located 6.5 km from Trincomalee. It provides spacious accommodation with a freshwater pool, 3 dining options and free Wi-Fi. Simple yet modern rooms are air-conditioned, and equipped with tea/coffee making facilities, cable TV, and a minibar. Chaaya Blu Trincomalee has a PADI certified dive centre that provides water sport activites such as snorkelling, fishing and scuba diving. Captain's Deck serves a range of Asian and continental dishes. The Crab Restaurant offers delicious seafood, featuring crab specialities. Drinks and light snacks can be enjoyed at the Rumhold. Chaaya Blu Trincomalee is located on the north-eastern coast of Sri Lanka, the fifth largest natural harbour in the world. It is 265 km from Bandaranaike International Airport and 260 km from Colombo City. Set up in the forest bordering the Dambana Village, home to the last remaining tribe of Sri Lanka’s indigenous people, Mahoora Tented Safari Camps offers a unique camping experience. Dambana is accessible via Kandy from Colombo, which is 208 km away. Mahoora Tented Safari Camps – Dambana, Sri Lanka is 5 km from Mahiyanganaya town. Katunayake International Airport is approximately 281 km from the camp-site. Guests sleep in tents which feature 2 single beds and a seating area. A private bathroom with shower and toilet is included. Bandarawela Hotel is a colonial style mountain resort located along Welimada Road in Sri Lanka’s Uva Province. The hotel offers a restaurant, bar and a 24-hour front desk. Rooms at the Bandarawela Hotel come with air conditioning, a TV, radio and hairdryer. Accommodation and meals are free for hired drivers of in-house guests. Guests can enjoy recreation facilities such as tennis, badminton and billiards. A fitness room lets guests exercise. A currency exchange and tour desk is available. A variety of eastern and western dishes are served at the hotel main restaurant, which offers views of the surrounding tea plantations. A bar and lounge offers drinks and live music. Grand Udawalawe Safari Resort is located within a 10-minute drive from the famous Udawalawe National Park, Grand Udawalawe Safari Resort features an outdoor swimming pool and offers spacious rooms with views of the surrounding nature. The resort is just 500 m to Ath Athuru Sevana, an elephant orphanage, and approximately 160 km from Katunayake Airport. The Mahinda Rajapaksa International Cricket Stadium is within a 40-minute drive away. Fitted with parquet flooring, air-conditioned rooms are furnished with a wardrobe, a flat-screen satellite TV, an electric kettle and ironing facilities. En suite bathrooms come with a hairdryer, bathtub or shower facility.